When we think of drunk driving, we typically think of someone driving a car or truck while intoxicated. It is also important to understand that drunk driving doesn’t always have to involve a car. A person can be charged with drunk driving on a bicycle, pedicab, scooter, or anything else with wheels, with the one exception of a wheelchair. The reason a person cannot be charged with drunk driving in a wheelchair is because it would be discriminatory and the same as charging a person with a crime for walking while drunk. 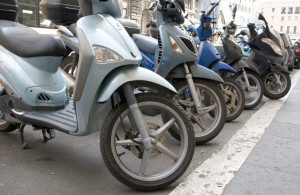 While it may seem strange to charge someone with the crime of operating a motor vehicle under the influence of intoxicating liquor or drugs (OUI) on a non-traditional vehicle, the Massachusetts legislature made the law this way because, for example, driving a moped while drunk is dangerous and can result in a serious accident. As our drunk driving accident lawyers in Boston have seen, a person can do a lot of damage and cause a lot of personal injury even when driving an unpowered bicycle while drunk. While the bicycle itself might not do that much damage, a drunk rider on a bicycle could easily cause a car to swerve, causing serious damage. According to a recent news article from CBS News, a man on a moped was just arrested for drunk driving, and this was his fifth drunk driving offense. For those that have not seen a moped, it is essentially a cross between a motorcycle and bicycle. It has a small motor, but there is no starting motor or kick-starter, so the rider must pedal like it is a regular bicycle until the engine turns over and starts running continuously. In this case, police say one officer was patrolling the area when he saw a moped weaving back and forth on the road. This was around 8 p.m. The officer turned on his emergency equipment and effectuated a traffic stop after the moped driver allegedly almost crashed the vehicle when overcorrecting after avoiding a crash. When police stopped the moped rider, they immediately detected the odor of alcohol and asked suspect to submit to a standardized field sobriety test. According to the police, suspect allegedly told officers “there is no why I’ll pass.” For reasons not explained in the article, the police decided to administer a blood test instead of a breath or urine test and are still awaiting results. Unlike on television, or at the hospital, where it only a takes a few hours to get blood toxicology back, it really takes around three months absent a rush order, which is not done in normal drunk driving cases, or even fatal drunk driving cases. However, even without the blood test results, police were able to arrest suspect for alleged drunk driving, and, because this was an alleged fifth offense, prosecutors filed felony charges. Drunk driving is normally a misdemeanor. It should be noted that suspect has merely been accused of committing a crime, and this is not the same thing as a criminal conviction. In the United States, all suspects are presumed innocent unless and until they are found guilty beyond a reasonable doubt.